Well after a couple of years of regular use my Duet board in my Ormerod died. 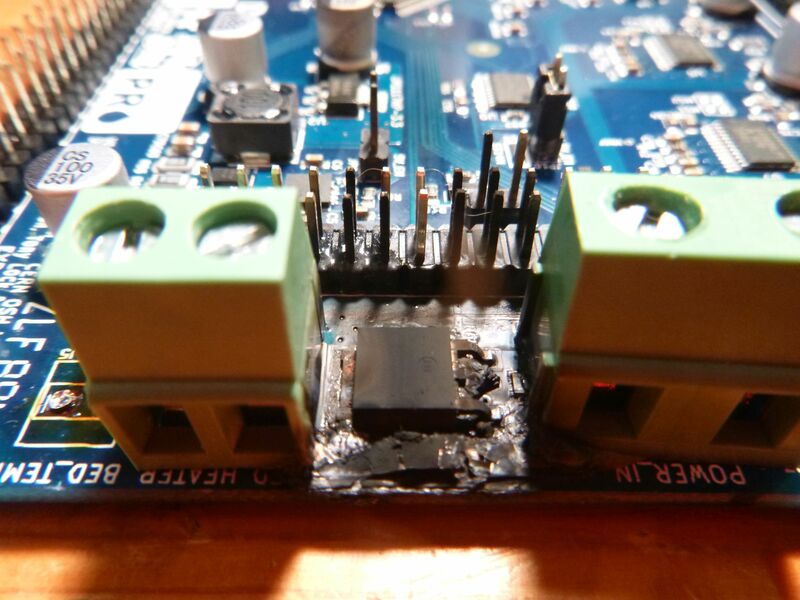 The MOSFET (I assume) that drives the heated bed burned out quite spectacularly, as per the attached picture. Everything else still works just fine. It's a testament to the printer as a whole that I've barely had to do a thing to it in this time apart from feed it filament and keep it clean. I could probably bodge a replacement on but I'm thinking just get a later board, how easy a swap is it going from the OEM one from RepRapPro to a current board? I've never heard of the bed heater MOSFET burning out on a Duet before. 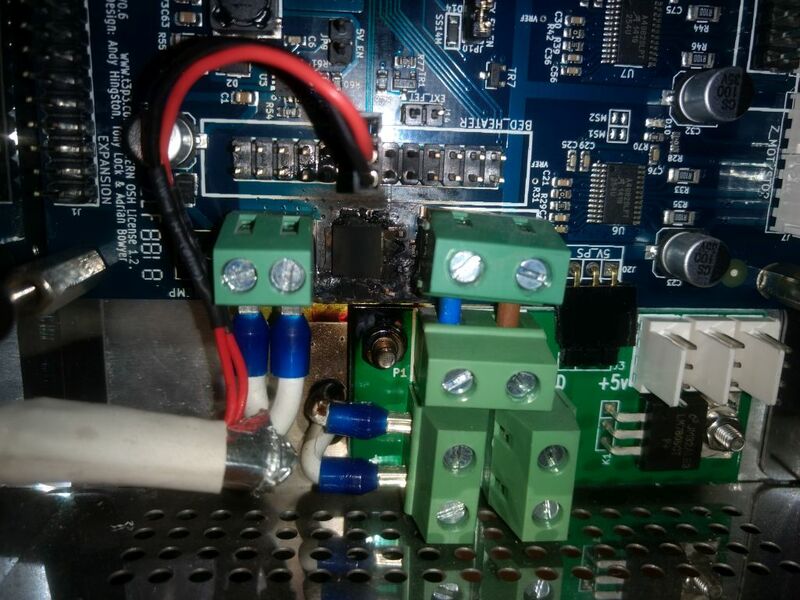 If you overload the bed heater circuit, the trace close to the edge of the PCB fuses. So I think there must be another problem. Possibly the 5V regulator isn't working properly, resulting in the MOSFET getting low gate drive. You can get a replacement Duet 0.6 from reprapltd.com at present, or a Duet WiFi or Duet Ethernet from Duet3D or one of their distributors. If you use a Duet WiFi or Duet Ethernet, you will be able to control the hot end fan thermostatically and you will have the means for dual extrusion; but you will need to make additional holes in the metal enclosure for the WiFi or Ethernet connector and the reset button. Whichever you choose, either check the output of the 5V linear regulator, or enable the on-board 5V regulator instead. It's an unmodified Ormerod, so I'm not convinced I overloaded anything. I've ended up having no time to look at this but I will do once we hit mid-April. I still think it's likely that the 5V rail is low, otherwise the mosfet would not have burned out. If you replace your Duet with one later than the 0.6 then I recommend you ditch the 5V linear regulator board and enable the on-board switching regulator instead. The later Duets have higher bed current ratings than the 0.6. Edited 1 time(s). Last edit at 04/01/2018 02:01PM by dc42. I'm very likely to buy a Duet Wi-Fi as a replacement so I'll bear that in mind, thanks. Just got my multimeter out and the 5V rail is dead on. It wasn't under any particular load as the printer was idle, but I'm assuming all the heavy current stuff is on the 12V rail. I got the Duet out and it's very very crispy. I can't imagine effecting a worthwhile repair even though the rest of the board works. I guess it's time to order that replacement.